The TCJA sets the unified federal estate and gift tax exemption at $11.4 million per person for 2019 (up from $11.18 million for 2018). For married couples, the exemption is effectively doubled to $22.8 million for 2019 (up from $22.36 million for 2018). The exemption amounts will be adjusted annually for inflation from 2020 through 2025. In 2026, the exemption is set to return to an inflation-adjusted $5 million, unless Congress extends it. The generation-skipping transfer (GST) tax generally applies to transfers made to people two generations or more below you, such as your grandchildren or great-grandchildren. Transfers made both during your lifetime and at death can trigger this tax — and it's above and beyond any gift or estate tax due. Under the Tax Cuts and Jobs Act (TCJA), the GST tax continues to follow the estate tax. So, the GST tax exemption also increases under the TCJA. For 2018, both exemptions are $11.4 million per person, or effectively $22.8 million for a married couple. The GST exemption can be a valuable tax-saving tool for taxpayers with large estates whose children also have large estates. With proper planning, they can use the GST exemption to make transfers to grandchildren and avoid any estate or gift tax at their children's generation. Taxable estates that exceed the exemption amount will have the excess taxed at a flat 40% rate. In addition, cumulative lifetime taxable gifts that exceed the exemption amount will be taxed at a flat 40% rate. Taxable gifts are those that exceed the annual federal gift tax exclusion, which is $15,000 for 2018 and 2019. If you make gifts in excess of what can be sheltered with the annual gift tax exclusion amount, the excess reduces your lifetime unified federal estate and gift tax exemption dollar-for-dollar. Under the unlimited marital deduction, transfers between spouses are federal-estate-and-gift-tax-free. But the unlimited marital deduction is available only if the surviving spouse is a U.S. citizen. Important: Some states also charge inheritance or death taxes, and the exemptions may be much lower than the federal exemption. Discuss state tax issues with your tax advisor to avoid an unexpected tax liability or other unintended consequences of an asset transfer. For married couples, any unused unified federal estate and gift tax exemption of the first spouse to die can be left to the surviving spouse, thanks to the so-called "exemption portability" privilege. The executor of the estate of the first spouse to die must make the exemption portability election to pass along the unused exemption to the surviving spouse. The portability privilege — combined with the increased unified exemption amounts and the unlimited marital deduction — will make federal estate and gift tax bills for married folks a rarity, at least through 2025. That's because the portability privilege effectively doubles your estate and gift tax exemption to a whopping $22.8 million for 2019 (with inflation adjustments for 2020 through 2025). Important: Exemption portability isn't a new privilege under the TCJA. It existed under prior law, and it will continue to exist after the increased estate and gift tax exemptions expire at the end of 2025. If your joint estate is worth less than $11.4 million, there won't be any federal estate tax due even if you and your spouse both die in 2019. That's because the unified estate and gift tax exemption allows either of you to leave up to $11.4 million to your children and other relatives and loved ones without federal estate tax or any planning moves. But there are still many reasons for you to create (or review) your estate plan. For example, if you have minor children, you need a will to appoint someone to be their guardian if you die. Or you might want to draft a will to designate specific assets for specific individuals. Likewise, if you're concerned about leaving money to a spouse or other individual who isn't financially astute, you might want to set up a trust to manage assets that person will inherit. Couples with joint estates between $11.4 million and $22.8 million are positioned to benefit greatly from exemption portability. If you die in 2019 before your spouse, you can direct the executor of your estate to give any unused exemption to your surviving spouse. If your spouse dies before you, he or she can do the same. The portability privilege effectively doubles your exemption. That means you and your spouse can transfer up to $22.8 million for 2019 (with inflation adjustments for 2020 through 2025) without incurring estate or gift tax. What if your joint estate is worth more than $22.8 million? The generous $11.4 million federal estate tax exemption, the unlimited marital deduction and the exemption portability privilege will work to your advantage. But you may need to take additional steps to postpone (or minimize) federal estate taxes. For example, Leon and Lucy are a married couple with adult children and a joint estate worth $30 million. They both die in 2019. Leon dies in February 2019, leaving his entire $15 million estate to Lucy. The transfer is federal-estate-tax-free, thanks to the unlimited marital deduction. Leon also leaves Lucy his unused $11.4 million exemption. When Lucy dies in November 2019, how much can she leave to her loved ones without incurring federal estate tax? Lucy's estate tax exemption is $11.4 million; she also has the portable exemption ($11.4 million) that Leon left when he died in February. So, she can leave up to $22.8 million to her beneficiaries without incurring any federal estate tax. Minimizing federal estate taxes on the remaining $7.2 million in Lucy's estate would require some additional estate planning moves. Alternatively, Leon could leave $11.4 million to his children (federal-estate-tax-free thanks to his $11.4 million exemption) and $3.6 million to Lucy (federal estate-tax-free thanks to the unlimited marital deduction). That way, when Lucy dies in November 2019, her estate would be worth $18.6 million (her own $15 million plus the $3.6 million from Leon). Then her exemption would shelter $11.4 million from the federal estate tax. Again, minimizing federal estate tax on the remaining $7.2 million in Lucy's estate would require some additional steps. Important: The same considerations apply if Lucy is the first to die. Make annual gifts. Each year, you and your spouse can make annual gifts up to the federal gift tax exclusion amount. The current annual federal gift tax exclusion is $15,000. Annual gifts help reduce the taxable value of your estate without reducing your unified federal estate and gift tax exemption. For example, suppose you have two adult children and four grandkids. You and your spouse could give them each $15,000 in 2019. That would remove a grand total of $180,000 from your estate ($15,000 × six recipients × two donors) with no adverse federal estate or gift tax consequences. This strategy can be repeated each year, and can dramatically reduce your taxable estate over time. Pay college tuition or medical expenses. You can pay unlimited amounts of college tuition and medical expenses without reducing your unified federal estate and gift tax exemption. But you must make the payments directly to the college or medical service provider. These amounts can't be used to pay for college room and board expenses, however. Give away appreciating assets before you die. In 2019, a married couple, combined, can give away up to $22.8 million worth of appreciating assets (such as stocks and real estate) without triggering federal gift taxes (assuming they've never tapped into their unified federal estate and gift tax exemption before). This can be on top of 1) cash gifts to loved ones that take advantage of the annual gift tax exclusion, and 2) cash gifts to directly pay college tuition or medical expenses for loved ones. To illustrate, say you give stock worth $2 million to your adult son in 2019. That uses up $1.985 million of your $11.4 million lifetime unified federal estate and gift tax exemption ($2 million – $15,000). Your spouse does the same. When it comes to gifts of appreciating assets, using up some of your lifetime exemption can be a smart tax move, because the future appreciation is kept out of your taxable estate. Set up an irrevocable life insurance trust. Life insurance death benefits are federal-income-tax-free. However, the death benefit from any policy on your own life is included in your estate for federal estate tax purposes if you have so-called "incidents of ownership" in the policy. It makes no difference if all the insurance money goes straight to your adult children or other beneficiaries. This unfavorable life insurance ownership rule can inadvertently cause unwary taxpayers to be exposed to the federal estate tax. To avoid this pitfall, a married individual can name his or her surviving spouse as the life insurance policy beneficiary. That way, under the unlimited marital deduction, the death benefit can be received by the surviving spouse free of any federal estate tax. However, this maneuver can cause too much money to pile up in the surviving spouse's estate and expose it to a major federal estate tax hit when he or she dies. Alternatively, large estates can set up an irrevocable life insurance trust to buy coverage on the lives of both spouses. The death benefits can then be used to cover part or all of the estate tax bill. This is accomplished by authorizing the trustee of the life insurance trust to purchase assets from the estate or make loans to the estate. The extra liquidity is then used to cover the estate tax bill. The irrevocable life insurance trust is later liquidated by distributing its assets to the trust beneficiaries (your loved ones). Then, the beneficiaries wind up with the assets purchased from the estate or with liabilities owed to themselves. And the estate tax bill gets paid with money that wasn't itself subject to federal estate tax. The TCJA generally improves the federal estate tax posture of taxpayers for 2018 through 2025. But, to achieve optimal results and cover all your bases, you may need to meet with your EHTC Tax Advisor and legal advisor to create or update your estate plan. Roth IRAs are a great tax saving vehicle. The reason: Investments held in a Roth IRA are allowed to build up federal-income-tax-free. Later on, you can take federal-income-tax-free withdrawals. Obviously, a zero tax rate is the best rate going. 1. Have a Roth account that's been open for more than five years. 2. Be age 59 1/2 or older. In addition to being great tax saving tools for retirement, Roth IRAs also provide tremendous estate planning advantages -- especially if you can get a large portion of your wealth into an account. Unfortunately, getting lots of money into a Roth IRA is not so easy. It can take many years of annual contributions. However, there's also one very quick way -- by converting an existing traditional IRA or SEP account into a Roth IRA. There are no limitations on the size or number of converted accounts. Naturally, under tax law, there is a price for allowing you to jump start your Roth IRA savings program with a conversion. Even so, it may be worth the price. A Roth conversion is treated as a taxable distribution from your traditional IRA. In other words, you're deemed to receive a taxable cash payout from your traditional IRA with the money going into the new Roth account. So the conversion triggers a current income tax bill. In most cases, however, this negative factor is outweighed by the following positive factors. You don't have to pay the 10% premature withdrawal penalty tax on the deemed distribution that results from the Roth conversion transaction. This is true even if you're under age 59 1/2 when the conversion takes place. Your conversion tax bill may be significantly lower, depending on the future fate of tax rates. Some people believe the tax rates we have today could be the lowest rates we'll see for the rest of our lives. No one knows, of course, but now could be a good time for a Roth conversion. The value of the traditional IRA (or IRAs) you want to convert may still be down because of poor investment performance in recent years. However, a lower account balance means a lower conversion tax bill, which is a good thing. The usual reason for converting a traditional IRA into a Roth account is to earn tax-free income that will be withdrawn after age 59 1/2 to help finance your retirement. But if you don't really need the money for retirement, there's another less-publicized advantage to converting. Let's say you would like to pass along as much wealth as possible to your heirs. If so, a Roth conversion transaction can be a great estate planning technique for you. Don't misunderstand. Roth IRA balances are not exempt from the federal estate tax (nor are traditional IRA balances). However by paying the up-front Roth conversion tax bill, you effectively prepay your heir's future income tax bills while reducing your taxable estate at the same time. And this prepayment of income tax doesn't result in any gift tax or diminish your $5.60 million federal gift tax exemption for 2018 or any federal estate tax exemption (up from $5.49 million in 2017). But there is even more to pass on to your heirs. A big advantage of Roth accounts is they are not subject to the required minimum distribution rules that apply to traditional IRAs. These rules force the account owner to begin liquidating his or her IRA after turning age 70 1/2. Of course, this means Uncle Sam and state tax collectors take their cut in the form of taxes on the distributions. When you don't need the IRA money, being forced to take these required minimum distributions and pay the resulting income taxes can be pretty costly. But converting a traditional IRA into a Roth account stops required minimum distributions. Once a conversion is complete, you are free to leave the account balance untouched and accumulate as many tax-free dollars as possible to pass along to your heirs. However, the required minimum distribution exemption ends when you die. At that point, the Roth IRA falls under a set of the required minimum distribution rules that apply to all inherited IRAs (traditional and Roth). If your heirs are disciplined enough to take only the annual required minimum distribution amounts from the inherited Roth IRA, the account liquidation process can be strung out for many years, as the following example illustrates. What happened in this example? In effect, the husband and wife took advantage of the Roth IRA rules to establish a nice federal-income-tax-free annuity for their daughter. Step 1 - Designate your spouse as the Roth IRA beneficiary before you die. Step 2 - After your death, your spouse must treat the account as his or her own by re-titling it in his or her name. Step 3 - Your spouse must also name your child as the new Roth IRA beneficiary. Step 4 - Finally, your child must begin taking annual required minimum distributions by no later than December 31 of the year following the year of your spouse's death. Otherwise, your child will be required to liquidate the inherited Roth IRA after only five years, which would end the tax-free strategy prematurely. As you can see, a Roth IRA can be a great estate planning vehicle. However, before implementing this strategy, get professional advice about the conversion tax consequences and the estate planning considerations. Why Have a Business Valued? Most business owners are reactive when it comes to having their businesses valued. But it sometimes pays to be proactive. Some valuations are necessities, such as for determining the value of the business interest in an estate. Others are obtained for more elective reasons but are helpful to business owners nevertheless. While estate planning can be complex for all families, it can be especially complicated for those who remarry. In addition to considering your spouse and children in your current marriage, you may have children from prior marriages and stepchildren. Ensuring that everyone is treated fairly can be a challenge. It's not enough to put together an estate plan for your immediate family. You should also consider any inheritances you might receive from other family members. For example, you might stand to inherit a huge sum from your parents or in-laws. This can complicate matters if you're trying to reduce the size of your own taxable estate. Despite its name, the term "dynasty trust" has nothing to do with aristocracy or the TV show that used to be popular. It involves preserving wealth for your heirs. 1. Deaths - If individuals named (as heirs or executors) have died or they become incapacitated, a will should be reviewed to ensure changes are not needed. Before it's too late, people should let someone know where their original will is stored. If one can't be found after a person dies, a court may decide it was destroyed. It's a good idea to keep a copy in a safe deposit box, but don't put the original there without checking state law. Some states require that safe deposit boxes be sealed after the renter dies. Have your attorney and/or your accountant retain the original will. Ask them what will happen to the document if they die, move, or quit practicing. Store the will at home. Of course, it could be lost, destroyed or discovered by an interested party who could deliberately destroy, conceal, or alter it. 2. Assets - Revisions may be needed if the value of assets has increased or decreased significantly, or they are no longer owned. For example, if you specifically leave your home to one of your children, and later sell it, you may want to change the distribution of your other assets. 3. Marriage - Wedding bells usually signal the need to review a will. 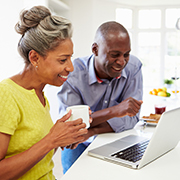 Which assets should pass to your spouse? Are step-children involved? If this is not spelled out in a will, the state will decide. In a community property state, a spouse automatically inherits half of all community property. In most other states, a spouse may receive one‑third to one‑half of the estate, absent any other directions. Also, keep in mind that an unmarried couple living together may want to leave assets to each other but in order to make an inheritance happen, it must generally be spelled out in a will. 4. Divorce - In many states, a divorce automatically revokes a will or those provisions concerning an ex‑spouse. As a result, if you get divorced, it's best to have a new will drafted. For instance, you might have your former spouse removed as a primary beneficiary. In addition, you may want to change the beneficiary of your life insurance, pension or any existing IRAs. Consider the use of a trust if children from a previous marriage are involved. You may also want to change your will if one of your children gets divorced. 5. Births - Once parents have children, you may want to consider updating your will to include the names of children. Also, you want to name guardians to care for the children in the event the parents die prematurely. (However, the naming of guardians is not binding by the probate court.) Grandparents might wish to draft a new will concerning the distribution of assets after children are born. Again, the use of a trust may be recommended. 6. Retirement - This event may also trigger the need to make changes to an existing will. For example, many retirees sell their homes and move to other states. But state laws can vary widely. Furthermore, individuals may consider a power of attorney that enables someone else to act on their behalf in the event of certain illnesses. 7. Tax law revisions - The Internal Revenue Code is regularly changed. In fact, the estate tax rules have undergone significant changes in recent years and more changes could occur. A will should be reviewed to take advantage of maximum tax benefits that exist today so it may have to be updated if tax laws change. Note: In some cases, a will might be amended with a "codicil." However, in many cases, it is best to draft a new will. Your estate planning adviser can guide you on how to proceed. Consider this dilemma faced by a high-net worth individual: He doesn't want his heirs to be burdened with estate taxes so he takes out a life insurance policy to cover the tax bill. But then the proceeds of the insurance policy wind up as part of his estate — only to be included for estate tax purposes. In this case, the individual might solve the problem by setting up an irrevocable life insurance trust (ILIT). Last year, the average U.S. wedding cost $32,641 — including engagement rings but excluding honeymoons — according to the 2015 Real Weddings Study published by The Knot, a wedding marketplace and concierge service. That staggering amount represents an increase of more than $5,500 over the past five years.